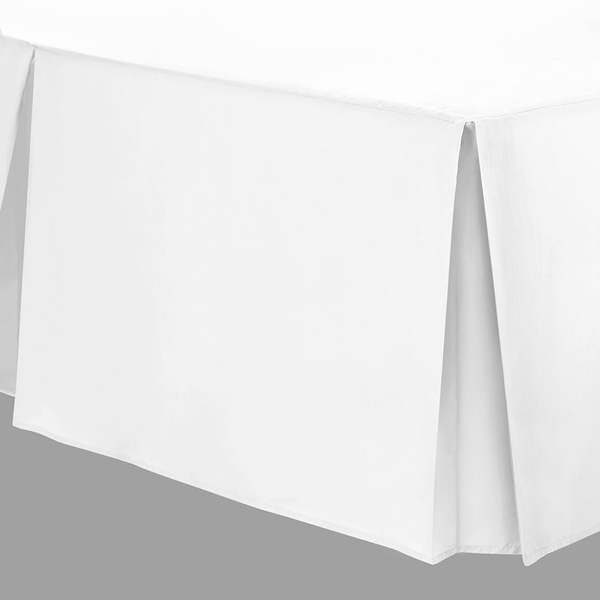 Also known as a base valance or bed skirt. Revitalise your divan bed base with a bed valance. Available in a range of bright colours in quality cotton and easy care fabrics. Fits easily over the divan, hiding your base or any under bed storage. Available in several frill types and any drop required. Small Single Valance in Easy Care 50/50 Poly CottonBed Valance to fit 2ft 3' x 6ft 6", 69 x 200cm Be.. Double Divan Valance in Panama Fabric.Valance in a luxury fabric for a fuller look. Panama is ..
Divan Valance Valance in Panama Fabric.Valance in a luxury fabric for a fuller look. Panama is.. Single Divan Valance in Panama Fabric.Valance in a luxury fabric for a fuller look. Panama is ..
Super King Divan Valance in Panama Fabric.Valance in a luxury fabric for a fuller look. Panama..
Base valance for UK Double 4ft 6in x 6ft 3in, 137 x 191cmAvailable in Frilled, Box Pleated or Double..
Base valance in Hotel Quality 400 Thread Count, 100% CottonMade to fit UK Double 4ft 6in x 6ft 3in, ..
Base valance in Hotel Quality 400 Thread Count, 100% CottonMade to fit UK King 5ft x 6ft 6in, 153 x ..
Base Valance for UK King 5ft x 6ft 6in, 153 x 200cmAvailable in Frilled, Box Pleated or King Pleat s..
Base valance for Long Single 3ft x 6ft 6in, 76 x 200cmAvailable in Frilled, Box Pleated or Single Pl..
Base valance in 400 Thread Count, 100% CottonMade to fit UK Single 3ft x 6ft 3in, 92x 191cmAvailable..
Base valance for UK Single 3ft x 6ft 3in, 92 x 191cmAvailable in Frilled, Box Pleated or Single Plea..
Base valance for Small Single 2ft 6in x 6ft 6in, 76 x 200cmAvailable in Frilled, Box Pleated or Sing..
Small Super King Cotton Base ValanceIn sateen finish 400 Thread Count, 100% Cotton percale*Made to f..
Base valance for Small Super King 5ft 6in x 6ft 6in, 170 x 200cmWe make all types of bedding to fity..
Base valance in Hotel Quality 400 Thread Count, 100% CottonMade to fit UK Super King 6ft x 6ft 6in, ..
Base valance for UK Super King 6ft x 6ft 6in, 183 x 200cmAvailable in Frilled, Box Pleated or Super ..
Small Single Valance in Easy Care 50/50 Poly CottonBed Valance to fit 2ft 6' , 76cm Beds. Available ..
Small Single Easy Fit Velcro Valance Made in Easy Care 50/50 Poly Cotton Percale*Velcro Valance to f.. Bed Valance / Divan Cover for Long Single BedBase Valance to fit 90 x 215cm, 3ft x 6ft 6" bedsLong S..